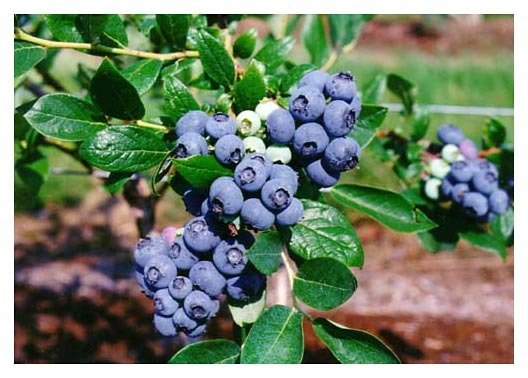 The blueberries belong among the healthiest and even curative delicatessen fruit. They help by anaemic, make better digestion and stabilise the blood sugar value and bring back the strength and vitality to your organism, because they are full of vitamins and minerals. Any kind of berries, especially American blueberries have high nutritive value. They contain sugar, dry substance, sour substance, vitamins, minerals and also many of colouring matters, such as antocianes are. The blueberry’s evaporatable substance that is configurable different as wild blueberry’s evaporatable substances give the Blueberries special, accordant taste. Lately producers often dry this fruit for storing because of quicker dehydration. In that case they contain only 5 to 10 % of moisture, which give them after another watering the same strength and significant fresh fruit taste. Such as all kind of berries also the blueberries are low calorie fruits. They are important in dietetic and domestic medicine. Because of the high value of sour substance, aromatic substance, pectins, they stimulate salivation and help by digestion. High value of K in berries makes the fluid elimination out of organism. Berries also contain tannin that provides them the function of disinfect and vein wall protector. It is also known that absorption of blueberries reduces renal stones problems, inflammation of the bladder, chronicle intestinal, haemorrhoids, dysentery. Fresh blueberry juice is a proper disinfectant substance for oral cavity and throat. The blueberries have also a special meaning place in eating habits and at restricting diabetic problems. The natural colouring matter mirtilin that we can also find so in berries as in blueberry’s leaves restrict and reduces blood sugar value. Good result by healing diabetics also brings drinking blueberry leaf tea.